AQUAPOT is a leading RO Antiscalant Manufacturers in Hyderabad. Aquapot RO Antiscalant Manufacturers in Hyderabad is manufacturing quality RO Antiscalants and supplying across india. AQUAPOT are the specialists in RO Antiscalant Chemicals Manufacturers in Hyderabad. With a world class quality chemicals manufacturing facility in Hyderabad we are leading the industry. 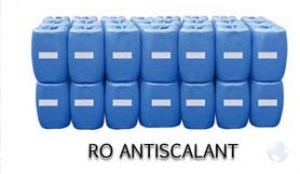 RO Antiscalans is normally fed continuosly prior to the cartridge filter. Antisclant should be injected by chemical dosing pump from a dilution tank or directly from the drum to the feed water line. The amount of Antiscalant required to inhibit scale formation depends on the quality of feed water and operational parameters of the membrane system. The specific ranges will be specified by the technical representative and can also assist you in determining the appropriate dose rate of Antiscalant for your system. Antiscalant Safety and Handling Store in a cool, dry place, In accordance with good safety practice, handle with care and avoid contact with eyes and prolonged or repeated contact with skin. At Aquapot we are dealing all types of RO Chemicals. Our company is named as the trusted RO Chemical Suppliers in Hyderabad.